Literally allergy “another action” show (from the Greek allos = different; ergon = effect). An allergy is an enhanced immune system reaction against foreign substances. There are usually harmless substances from nature and the environment to which the immune system over-reacts. Through breathing, contact to the skin or by ingestion enter the allergens into the body and trigger a cascade of immunological processes. Any substance can cause an allergy. If it is not treated, it usually gets worse and may further lead to bronchial asthma or atopic dermatitis. A repeated contact with this substance can also cause a changed response. Either the response is amplified, attenuated or completely absent. The term allergy means an amplification of the response. In the immediate type of allergy the symptoms occur within minutes after exposure to the allergen ( trigger ) and they can cause hives on the body, swelling of the lips and eyelids, rhinitis, asthma and gastrointestinal complaints. Possible triggers include pollen, dust mites, animal dander, insect venom, foods, drugs, etc. This form of allergy is clarified with a so-called skin prick test, a twenty- minute long skin test and / or a blood test. The delayed type of allergy is a contact allergy. 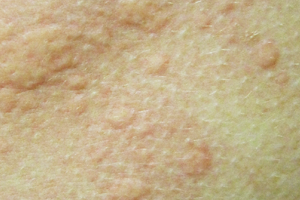 In this the symptoms occur only one to three days after coming into contact with the allergen and result in the formation of eczema. Known cause of this form of allergy is the nickel in jewelery or perfumes in cosmetics. The investigation is carried out with the so-called epicutaneous test (eczema test). Here are the possible triggering agents and natural samples, such as your cosmetics, glued to the back and the response is assessed after two and three days after that. In an interview with the patient, we try the type of allergic reaction to determine more precisely by means of skin tests and will depend on your symptoms further tests (skin tests, such as skin prick test or patch test) or blood tests. 1 The reduction of contact with the triggering allergens. 2 Depending on the type of diagnosed allergy, we recommend oral medications that suppress the allergic reactions (eg, antihistamines) or a local treatment in the form of a cream. 3 Occasionally, for example a desensitizing be useful in a hay fever or asthma. Immunotherapy (desensitisation): with this treatment the allergy can be cured and the symptoms get better. The body gets used by a injection or by oral therapy in the form of drops to the causative allergen in small amounts, so that the immune system is trained against the allergen. For the treatment of hay three years and for bee-/wesp venom allergy five years are needed.